and host of the Ayrshire Internal Strength Study Group. PLEASE NOTE: There is no Internal Strength session on Thursday 25th April. We take our Aikido direction from John Burn sensei, chief instructor of Chishin dojo in Coventry and the only UK direct student of Hiroshi Ikeda sensei. 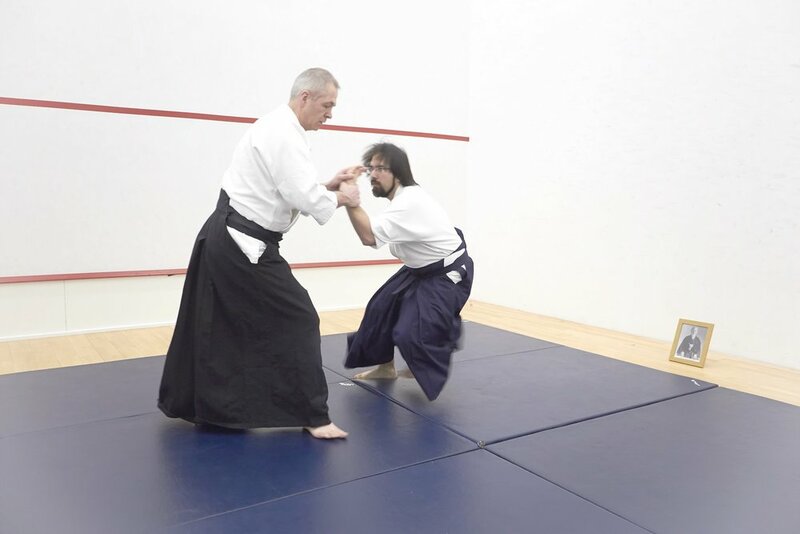 John sensei has trained extensively in internal strength methods as taught by Mike Sigman and is a pioneer in introducing these, also known as 6 Harmonies principles, into Aikido technique. Study of internal strength is central to the practice of Ayr Aikido Club. We are proud to be members of UK Aikido Shimbokukai, and through this to be members of the international organisation Aikido Shimbokukai. This gives us membership of, and gradings ratification by, Aikikai Foundation (World Aikido Headquarters at Hombu dojo in Tokyo, Japan). We are affiliated to the British Aikido Board, from whom we obtain our insurances and instructor accreditation. The club instructor is Jamie Lewis, who holds the grade of Shodan (1st Dan black belt). Jamie has been training in Aikido for 10 years, and has an interest in developing Internal Strength principles of movement and introducing these into his Aikido practice. A different way of structuring the body to generate power and deal with incoming forces. This involves the study of posture, co-ordination of movement, focus of attention and breathing. While these principles have wide application in martial arts, the study group is not a martial arts class. It will be of interest to those wishing to explore this fascinating way of moving in its own right. No martial arts uniforms are worn in the study group and no association memberships are required to join it. This includes Internal Strength Study Group attendance.